CurrentPlanetaryPositions.com : We are sorry, but due to increasing server loads, we can no longer offer the current planetary positions widget to new websites. Thank you for your interest. 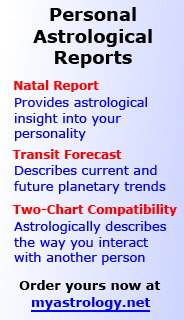 Personal Chart Reports provide analysis and forecasts based on your individual natal chart. Select natal interpretation, 6-month or 12-month forecast, or two-chart compatibility report. We are sorry, but due to increasing server loads, we can no longer offer the current planetary positions widget to new websites. Thank you for your interest.